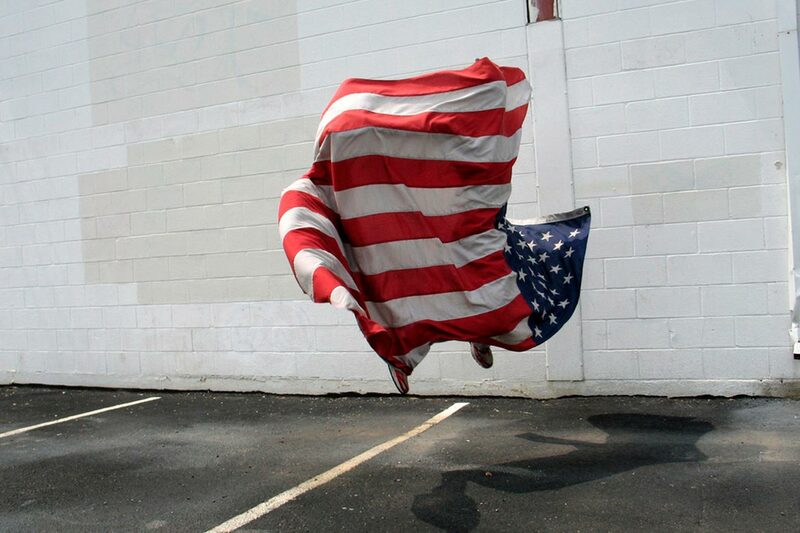 William Hundley manages to combine both photography and sculpture in his work. Whether he places skateboards or dogs on cheeseburger, naked people on shelves or on a fridge, or takes photographs of jumping people beneath all sorts of fabric – Hundley’s images do not come along as plain photographs. The camera functions as the medium to record his ideas – or rather sculptures in and of every day life. Entoptic Phenomena is one of Hundley’s most amazing sequences. The pictures show different fabrics levitating and hovering in the middle of the air. 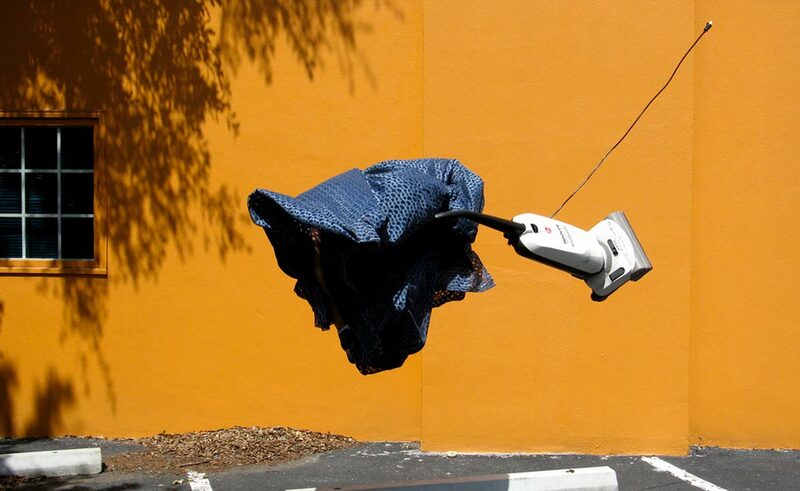 Next to a rubbish bin, a horse or friends of Hundley – the flying cloth appear as freezed sculptures. Hundley catches a ephemeral moment. His image do not only ban time, they also seem to work against gravity and definitely against all logical thinking. Even though the images look like a lot of post editing was done – let us tell you: they were not. William Hundley told us: “All of my work is done in-camera. I don’t use digital manipulation (with the exception of minor color and contrast adjustments only if needed).” His photographs are the result of many, many jumps to capture the perfect moment. There are real people beneath the fabric. 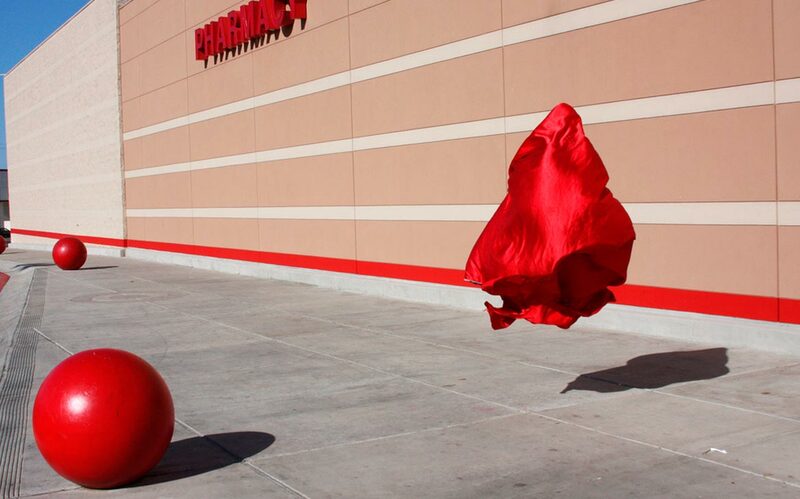 The mixture of gravity, speed, fold draft, coordination, natural lighting and William Hundley’s feeling for the perfect moment create his spectacular images. Every detail fits in Hundley’s photographs. Every Cheeseburger in his series W/Cheeseburger is placed in the perfect angle. Every item in his projects Little Naked Person Storage supports the “naked sculptur”. With his newest images Hundley deals with portraits – but let’s put it that way – in a rather a-typical style. Check out the images so see what we mean! 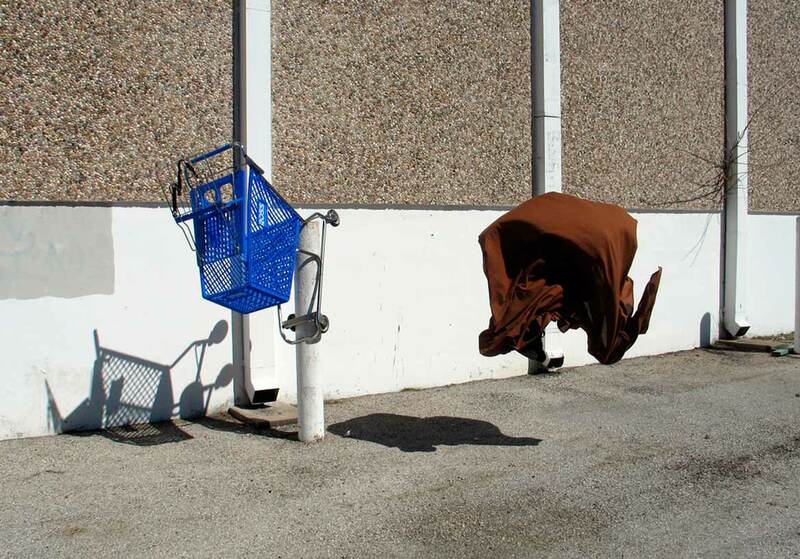 William Hundley’s photographs combine a lot, lot, lot, of talent, creativity and definitely some amazing Style. William Hundley, born in 1976, lives and works in Austin, Texas. William answered some questions for us/you! Check out what he has to say! Photography started for me as a way to capture an image or idea to recreate later via drawing or painting. At some point I started to really enjoy the photography itself. From their my intentions became to create images never seen before. I didn’t want to just take pictures of things. I wanted to capture surreal imagery via simple means – to perform magic in the eyes of the viewer. Do you use/prefer digital or analogue photography? It is often assumed that my work is the product of digital manipulation, but that is not true. People have told me that they are impressed by how accurate my shadows are….as though I digitally insert them! I think it is funny because I just take pictures with a camera and hope for the best. Many years ago I was a graphic designer and decided to quit and never again use my visual creativity as a source of income. I went and got a “regular” job and haven’t looked back since. At that point my creativity became mine again and I was free to pursue any bad idea that I wanted to. It felt like a pack of wild horses had been let loose in my head. I don’t really have a message with my work. I enjoy confusion and ambiguity and prefer the viewer to reach their own conclusions. I appreciate the multitude of ways my photographs can be interpreted. I think by leaving it open like that it allows for the opportunity to better understand the human condition by asking questions about our perception. See more off the ground pictures and dive into Hundley’s World.